Lately, Louis van Gaal has come under a lot of pressure from the fans. The Old Trafford faithful want to see a change in formation or tactic which will see their side score more often. It has been 3 games now and United have failed to score a single goal. So here are a few possibilities from a fan’s point of view which could help Manchester United in creating and converting chances and convincingly winning that particular game. 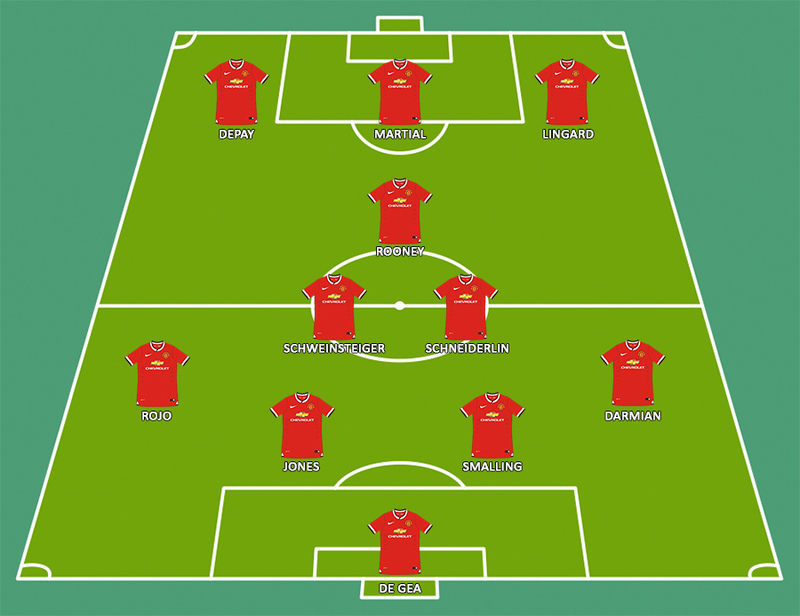 The current formation which is constantly deployed by Louis van Gaal. Defense – David De Gea guards the net and in front of him, the center back pairing of Chris Smalling and Daley Blind or Phil Jones. Matteo Darmian is the first choice right back with Antonio Valencia as his backup. With Luke Shaw injured and Daley Blind more likely to play a central role in defence or midfield, Marcos Rojo has become the first choice for the left back position. As United don’t have a proper back up for Rojo, England winger Ashley Young is the second choice left back. Midfield – Michael Carrick has played an instrumental role in United’s midfield since the retirement of Paul Scholes. But now, his form seems to be in decline as new signings Bastian Schweinsteiger and Morgan Schneiderlin form the midfield pair. Ander Herrera started off as a backup for either of the two, but now, he has been moved further up into an attacking position, right behind the striker. 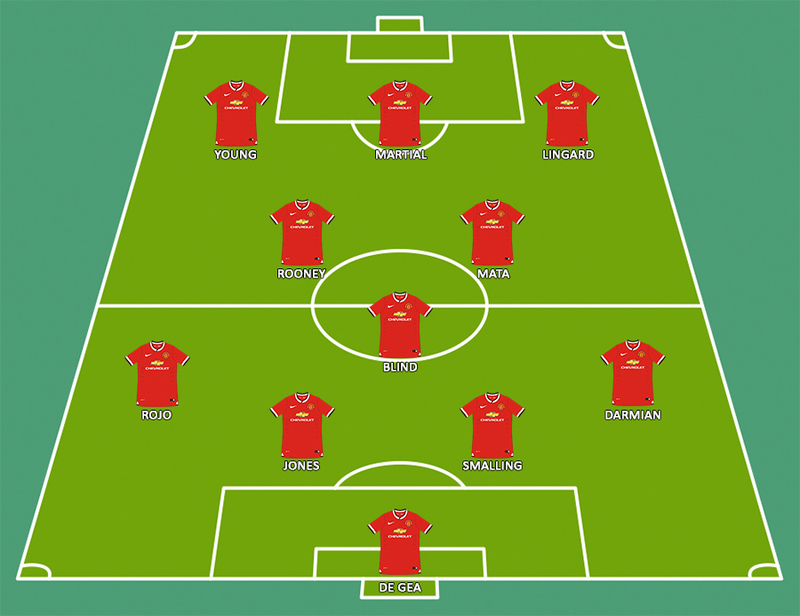 Offense – With Herrera playing in behind the striker, he has Juan Mata to his right. Mata who isn’t a proper winger is always drifting in during the game. So United basically play the entire game with just one winger. Memphis Depay was dropped by Van Gaal after a series of disappointing performances as striker Anthony Martial was put on the left wing. With the prolific young striker on the wing and Herrera as a number ten, there is just one position available for Wayne Rooney. It’s the position they wanted him to play in since the last season – As the main striker. These are the tactics put forth by Louis van Gaal. A simple 4-2-3-1 with one winger drifting in from the right side and the right full back making runs up and down the entire right flank. Sadly, the gamble of playing Rooney up top hasn’t paid off either as the English striker looks slow and sluggish and often tends to drop deep into the midfield, leaving United without a single player in the box when they win possession in the opponent’s half. Now, let us look at some alternative formations Louis van Gaal could deploy to change things and outcomes. Although the fans think (correctly it seems) that the former Dutch International Manager will stubbornly stick to his formation and tactics, let’s just see some of the top voted alternate formations for Manchester United. Defense – The defensive line will be the same which Van Gaal picks normally. Darmian on the right when the opposition wingers are physical; Valencia will start when they’re pacey. Smalling and Jones as the center backs, and Rojo on the left just till the time Luke Shaw returns to full fitness. 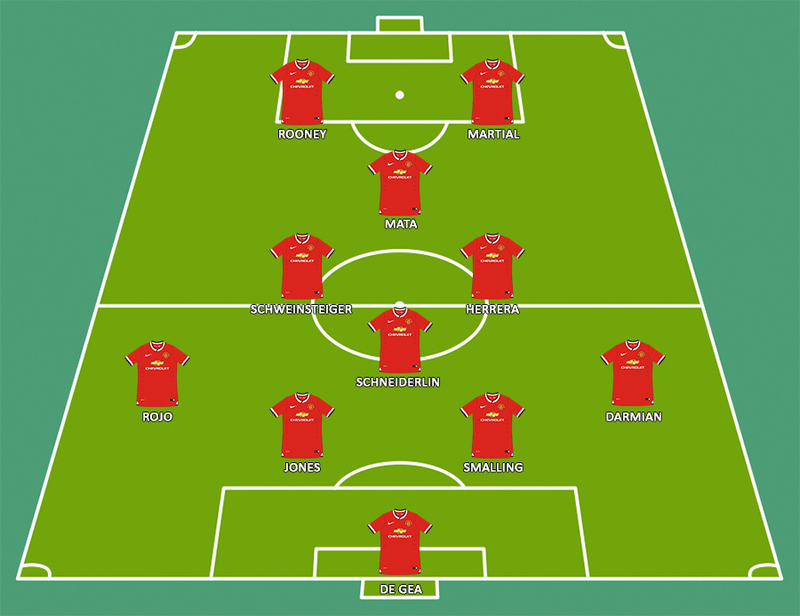 Midfield – Schneiderlin will sit at the bottom tip of the diamond with Herrera and Schweinsteiger in front of him. Juan Mata will get to play in his favourite #10 position at the tip of the diamond just behind the two strikers. Offense – If Van Gaal is adamant about playing Rooney only as a striker then he might just play him alongside another striker just to take a little bit of pressure off him. With a solid midfield behind them, Rooney and Martial can lead the attack and cause havoc in the box which they have failed to do until now. Every formation has its pros and cons. This formation does give United a pretty solid and tough midfield and good offence, but it weakens the team when it comes to wing play. As you can observe, you cannot fit wingers into a diamond. Attacks from the center will be lethal, but if the opposition counter from wide areas, it’ll be a nightmare for the fullbacks to defend. Midfield – Either one of Schneiderlin or Blind can be picked for the position which will be right in front of the defence, shielding it. Ahead of him, will be Depay or Young on the left wing, with Rooney and Mata in the midfield and youngster Jesse Lingard on the right wing. 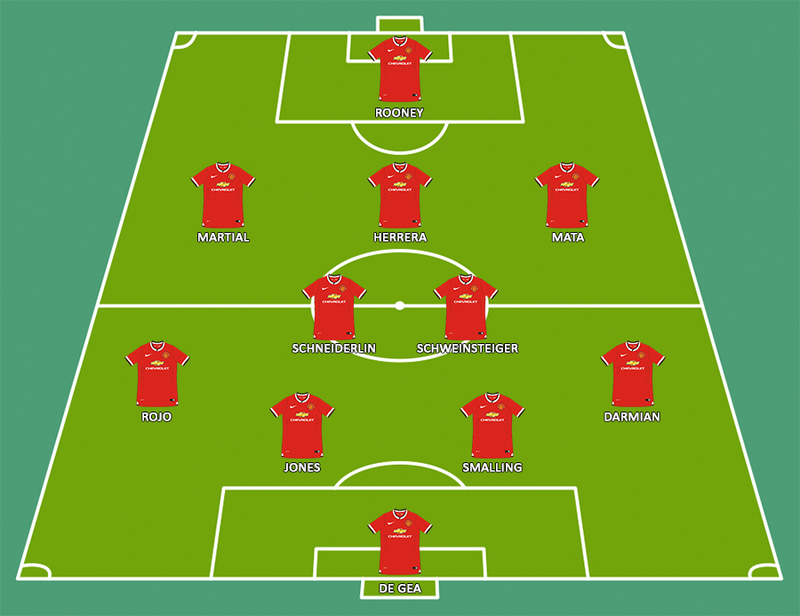 Offense – Anthony Martial gets to play in his first choice position with Rooney and Mata playing a creative role in behind him or Rooney can play up top with Mata and Herrera behind him. Lots of pros in this one as it looks perfectly balanced on paper. There can be trouble while defending a counter attack in midfield as the lone single defensive midfielder could fail to handle the pressure. But otherwise, it seems to be a very good and balanced formation, on paper and on the pitch if the players can maintain the shape. Midfield – For a defensive 4-3-3, There will be two central or defensive midfielders and one attack minded midfielder. Schweinsteiger and Schneiderlin can make up a great midfield in the defensive 4-3-3. In front of them will be Rooney as an advanced attacking midfielder. For an offensive 4-3-3, there will be just one defensive midfielder. Schneiderlin or Blind could fit into that position. The two advanced attack minded midfielders would be Rooney and Mata or Herrera. 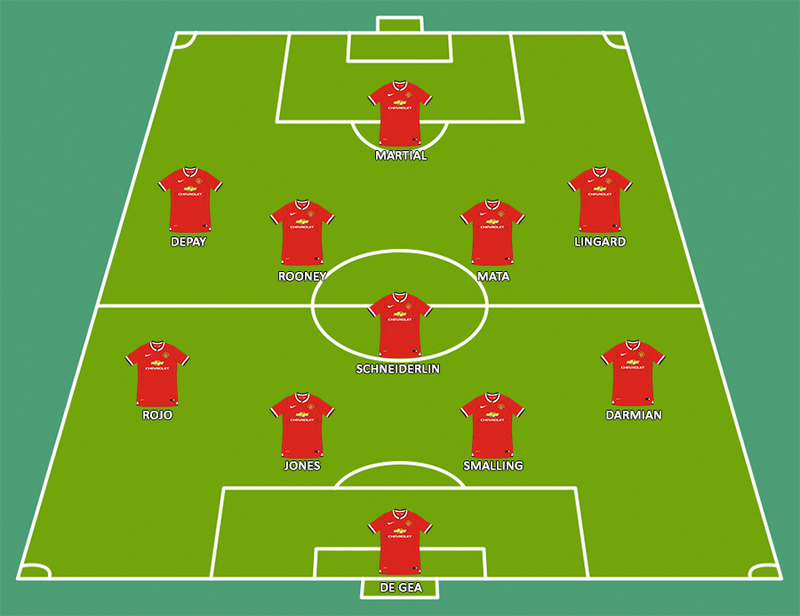 Offense – Depay will be placed on the left wing and Lingard on the right. Ashley Young can be the backup for them both while Anthony Martial will be the main striker. The Defensive 4-3-3 looks solid but doesn’t really suit Manchester United in the attacking area. It also leaves a couple of key players on the bench. The Offensive 4-3-3 leaves the defence a little vulnerable but once the players get used to it, it can work wonders. It’s the same formation Barcelona deployed. They still do, but I feel that United would be a bit unstable trying to play the 4-3-3 with the current crop of players.